Brave Spartans were left heartbroken as they lost out on the Ronnie Swan Cup 8-7 on penalties to Heart of Midlothian on Friday night (writes ALAN CLARK). The East of Scotland league side had been leading throughout the game and were 4-2 to the good with just a couple of minutes remaining, however Hearts scored a quick-fire double to take the friendly match to a shoot-out. Jack Beesley gave Spartans the lead with a deft chip before Mark Whatley doubled the home side’s lead after 20 minutes with a scissor-kick from the edge of the area. 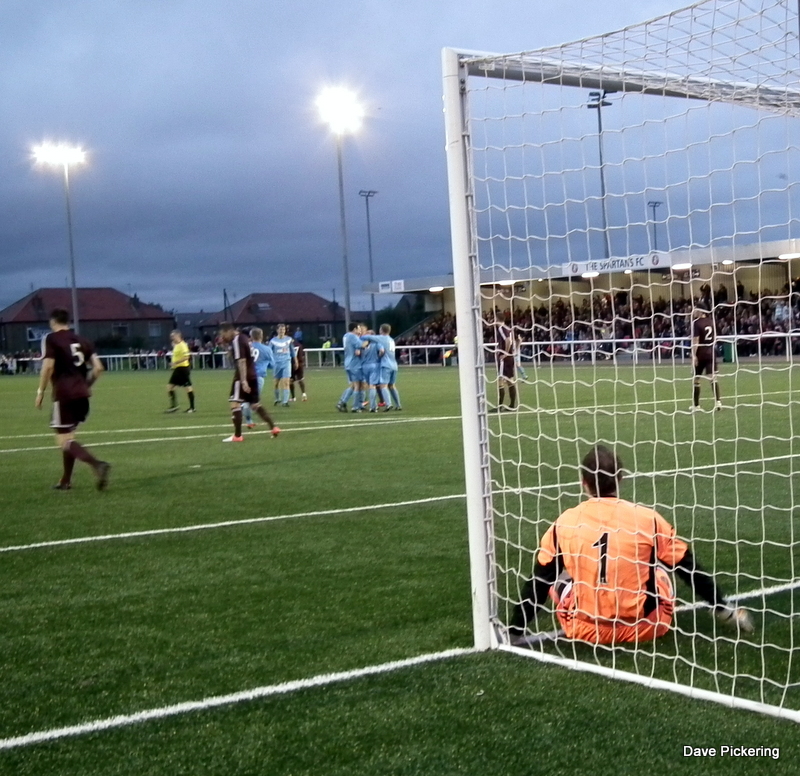 Scottish Premier League side Hearts responded just before half-time through Gordon Smith, however Spartans restored their two-goal advantage through Andy Martin early in the second half. Returning Jambo Ryan Stevenson made things interesting at 3-2, as Sean Wringe then looked to have made the cup safe for Spartans. There was more drama to come however as substitute Mehdi Taouil unleashed a 30-yard rocket into the top corner with minutes to go, which was followed by a last-minute leveller from fellow sub Sam Nicholson. After both sides scored their five penalties, the shoot-out entered sudden-death where Nicolson scored the cup-winning penalty. Due to the international break, Hearts boss John McGlynn agreed to take part in the memorial match for Ronnie Swan and the Scottish Cup holders brought a strong squad along to Ainslie Park, including first-team regulars Andrew Driver, Jamie MacDonald and Ryan Stevenson. The game started evenly with both sides attempting to find their feet but the hosts made the breakthrough after ten minutes. Jordan Finnie spotted Jack Beesley’s run and fed him the ball, with the Spartans midfielder using his first touch to chip Jambos keeper Jamie MacDonald beautifully – much to the delight of the home crowd. The Tynecastle outfit looked for a quick reply as they won a free-kick on the edge of the area. Ukrainian defender Denis Prychyenko let fly but his effort went wide of the post by three yards. The non-league side put themselves even further in front just ten minutes after the opener, Neil McCuish’s scissor-kick every bit as impressive as Beesley’s chip. The ball bounced on the left side of ‘the D’ and McCuish took a gamble by launching his whole body at the ball, which looped over MacDonald and into the inside of the side-netting. Spartans were in dreamland. Dale Carrick attempted a copy-cat of McCuish’s wonder strike but the Hearts forward watched as his effort went narrowly wide of the post. McGlynn’s side were looking more interested in the game after 35 minutes and almost got a goal back, Ryan Stevenson’s cross almost being turned in by Spartans no. 2 Danny O’Donnell. Jason Holt was next up to go close for Hearts as he made some space for himself in the box before sending his low drive into Ross Gilpin, who did well to use his legs save to his right. Just as Dougie Samuel thought Spartans would have a 2-0 half-time lead, striker Gordon Smith pulled a goal back for Hearts, poking the ball home from six yards after a ping-pong event in the box. Samuel didn’t have long to wait to see his side’s two-goal league restored however, the 54th minute seeing Spartans make it 3-1. Chris Anderson weighed his through ball perfectly for Andy Martin, who hit his shot across Macdonald’s goal and into the far corner. After 70 minutes, Spartans were believing it could be their night after all, as they smacked the bar with a ferocious drive from the edge of the area. MacDonald did well to palm it onto the bar, as it looked like it was heading for the top corner. With less than ten minutes to go, ex-Ipswich Town forward Stevenson got his name on the score sheet with a powerful shot from inside the area, however Spartans delighted their punters further by making it 4-2 a matter of seconds later. It was Anderson who was the supplier again as a great move culminated in the midfielder going past MacDonald, leaving him helpless as Sean Wringe beat a defender to squeeze home the fourth into an empty net. You could be forgiven for thinking that was that, but Hearts had other things in mind. Substitute and former Kilmarnock winger Mehdi Taouil took matters into his own feet as it were, as he picked the ball up 30 yards from goal and thumped home high into the keeper’s left-hand corner. With less than two minutes to play, this goal made Spartans sweat but rejuvenated Hearts and resulted in Sam Nicolson bundling home in the last kick of the game to make it an astonishing 4-4. The game was to be decided by penalties and after both sides scored their five penalties, the shoot-out entered sudden-death where Nicholson scored the cup-winning penalty. Hearts were presented with the Ronnie Swan trophy in front of the main stand at the end of an enthralling friendly bout in front of 1,200 fans. SPARTANS: Ross Gilpin, Danny O’Donnell, Gary Cenerrazzo, Kevin Sivewright, Neil McCuish, Robbie Manson ©, Jack Beesley, Mark Whatley, Jordan Finnie, Chris Anderson, Donal Henretty. Subs: Sean Wringe, Keith McLeod, John Grant, Andy Martin, Willie Bremner, Peter Mair, Chris Flockhart. HEARTS: Jamie MacDonald, Dylan McGowan ©, Kevin McHattie, Denis Prychyenko, Brad McKay, Ryan Stevenson, Jamie Walker, Jason Holt, Gordon Smith, Dale Carrick, Andrew Driver. Subs: Mehdi Taouil, Jack Hamilton, Callum Paterson, Callum Tappin, Scott Robinson, Billy King, Adam King, Sam Nicholson.